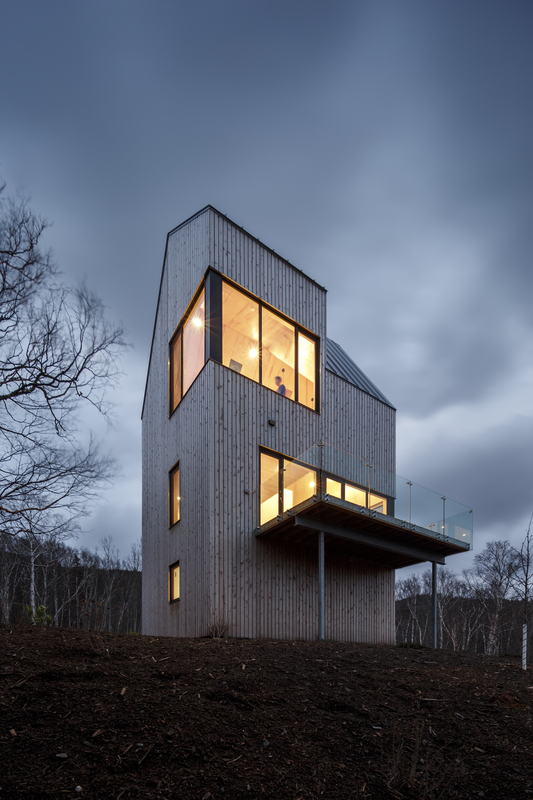 The Rabbit Snare Gorge in Iverness, Nova Scotia - a collaboration between Halifax based Omar Gandhi Architect Inc. and New York’s architectural firm Design Base 8 - holds ecological preservation and sustainability at the forefront of its design, executing it with flair! 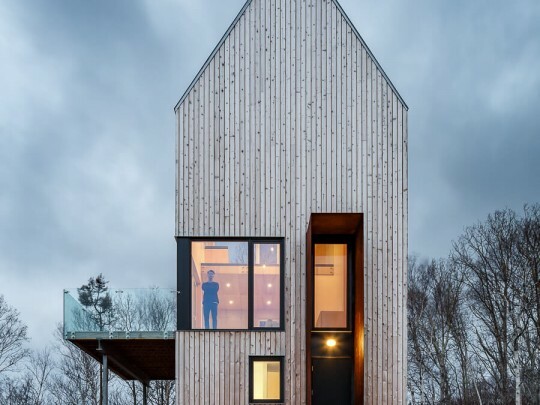 The barn, a symbol of practical form and function, was re-imagined to build this classic Nova Scotian home with a twist. The structure utilizes a small base square footage and height to its advantage in order to lessen the impact on the surrounding landscape and stray from the shape of a conventional home. 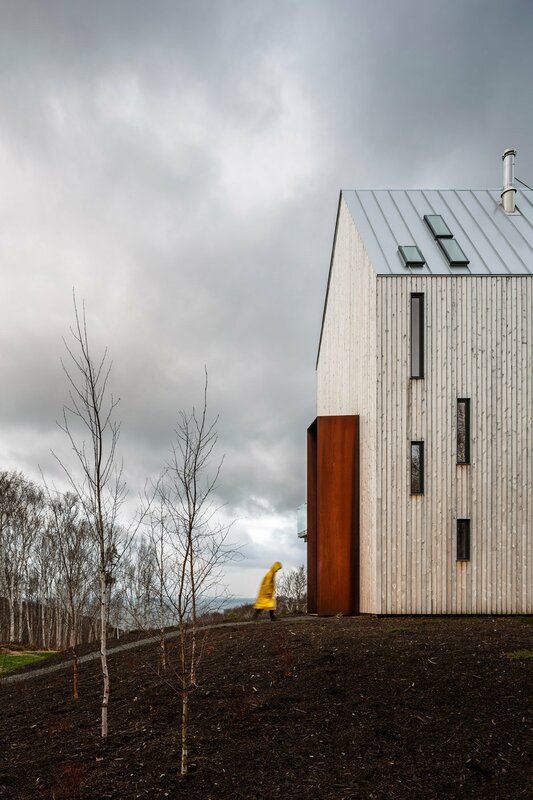 Since the structure is clad using local wood, the home is able to withstand Canada’s brutal coastal winters and respond with changing weather conditions, just like the materials have in this natural habitat for decades. The typology of the dwelling coupled with its use of local materials is a testament to site sensitivity and ecological preservation. 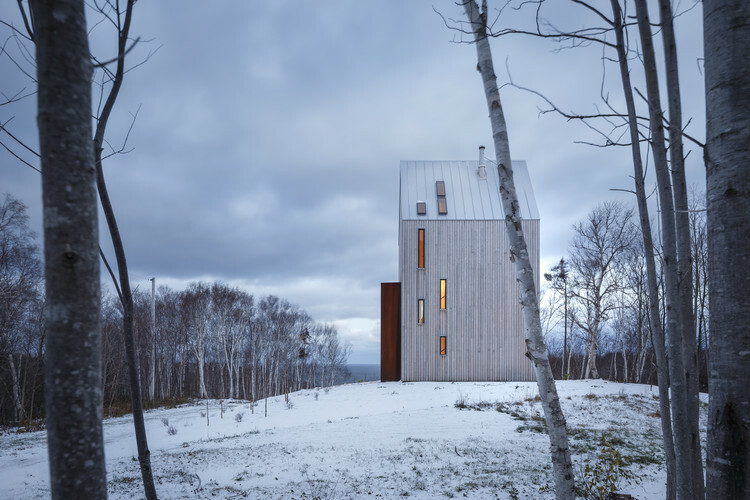 However, style and materials were not only decisions based in the realm of sustainability, they are also a nod to a longstanding Cape Breton building tradition - with which Nova Scotians have deep roots. Historically, homes built in this area were constructed using local materials and because this structure is built in the same way, this project had the added ability to embody the ‘old school meets new school mentality’. However, unlike traditional buildings in the area, the Rabbit Snare Gorge is unique. As a result of its height and slender frame, the homes shape adds a whimsical twist and almost illustrative quality to the structure. 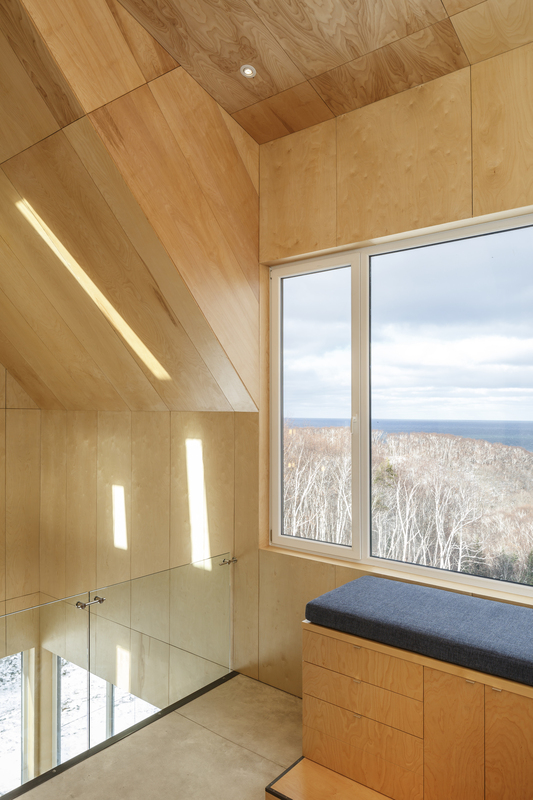 Built up and not out, the home becomes the ultimate viewing platform for stunning views of the surrounding landscape as it peaks above the lush Acadian forest to peer onto the Northumberland Strait and the Atlantic Ocean. Endless indulgence in the landscape is aided by a series of viewing platforms that protrude from the building horizontally (breaking the upward vertical thrust of the base structure). These platforms are enclosed with glass, which only adds to the illusion of an endless view, while also offering the inhabitants protection from the elements. Inside, the natural beauty and rustic aesthetic is not forgotten but rather enhanced. Natural wood is polished and left exposed adorning the walls, and the glass enclosures from the exterior viewing platforms are repeated - allowing a continuity and familiarity to the design. Large windows and dramatic angles frame and capture natural light which illuminates the interior. The Rabbit Snare Gore embodies a delicate balance between environmental sustainability and a design worthy of the cover of Canadian Architect. 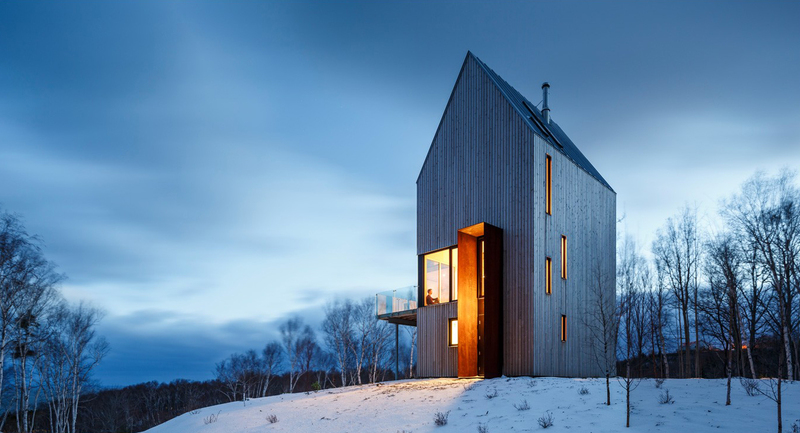 Built to withstand the whipping winds and angular rain characteristic of Canada's east coast, all while allowing for leisurely bird watching and star gazing on calmer days, there is no doubt that this petite home rests symbiotically - and literally - within the landscape. All images courtesy of Doublespace Photography (primary image), Omar Gandhi. Want to learn more about these two firms? Then make sure to visit Omar Gandhi Architect Inc and Based Design Base 8 to view their incredible portfolio. Researched and written by Amanda Salmon, a Bachelor of Fine Arts graduate from the Alberta College of Art and Design.